There is very little that is more beautiful than the soft lavender or deep violet of some of San Diego’s native flowering blooms. If you want to bring a spot of lovely color to your yard, let Juniper Landscape Company help you find and plant some of our lovely native flowers to bring out the violet in your landscape. Eggplant—The deep, rich purple of the eggplant hints at the soft pink, tasty flesh inside. 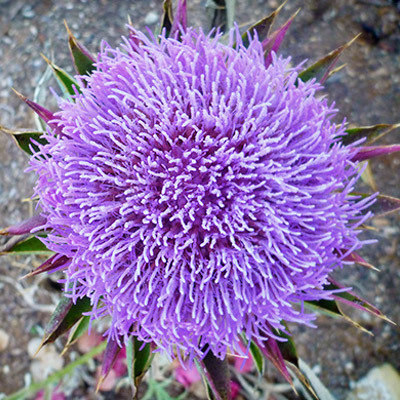 Artichoke—These blossoms are a beautiful lavender and the fruits are delicious delicacies. Wisteria—This flowering vine is a lovely addition to any trellis or gateway. Lilac—This hardy shrub regularly puts out lovely blossoms that look a bit like pine cones in shape. Purple needlegrass—This lovely groundcover is the state grass of California. Irises and roses—whether you choose a natural purple bulb plant such as the iris or a hybrid cultivated bloom such as the rose, purple blossoms are breathtaking in your flower beds. What Are Some Purple San Diego Plants I Can Use In My Yard? The Pride of Madeira or Echium candicans. This breathtaking plant can be seen in Old Town San Diego and was probably brought to the area by settlers from the island of Madeira. The lovely flowering stems are covered in purple blooms and the whole plant will grow up to nine feet tall, making this a great choice for the back of a flower bed. The Lily of the Nile, Agapanthus africanus. It is not a lily and does not grow on the Nile, but this beautiful flower is a favorite with its lovely purple blossoms. It also blooms in white. Iceplant, Carpobrotus edulis. The lovely star-shaped blooms of this low-growing ground cover appear in a beautiful lavender that stuns visitors to your garden. It is also one of the easiest plants to grow, requiring very little maintenance once they are rooted. Contact Juniper Landscape Company to find out how you can bring these and other beautiful plants into your San Diego yard.